Crock Pot Taco Cheese Dip - Recipes That Crock! Do you love a good queso dip as much as I do? Then you won’t want to miss this one! This Crock Pot Taco Cheese Dip is not only delicious, it is a great way to switch up your traditional queso dip. Little Miss Iyla has turned 3 months old already and is growing leaps and bounds! I am no longer exempt from bringing yummy goodies to pitch-ins…I think that exemption ended somewhere around when she was 4-6 weeks old. That’s okay though because this Crock Pot Taco Cheese Dip is easy peasey! At Christmas at my mother-in-laws, I tried this dip, and it was awesome! The name was Dragon’s Breath, though I am not sure why. It isn’t hot and doesn’t make your breath particular atrocious, so who knows?! I just knew that I was going to make it for the New Year’s Eve party we were attending. There was a problem though. It was my sister-in-law’s mother-in-law (that sounds like the start to a bad joke doesn’t it?) that made the dip for their family’s Christmas and my sister-in-law just happened to bring the leftovers for us to enjoy, so no one knew the recipe. Since I didn’t have access to the recipe, I had no choice but to keep tasting it to figure it out (tough job, but somebody’s got to do it). 😉 And by golly, I am proud to say that I think I did a pretty good job! I sent Cris an email and told her I had a great new dip that I wanted to share with y’all and told her the name. Later we were talking and she asked me what exactly was in this “Devil’s Spit” that I wanted to share and if it was hot or just plain evil. Ha! I thought Dragon’s Breath was an unappealing name for this yummy dip, but Devil’s Spit sounds just awful! So we decided to do a little renaming. This Crock Pot Taco Cheese Dip ranks right up there with Bacon Cheeseburger Crock Pot Dip, and if you have tried that one you KNOW that is high praise for this dip! And as a special bonus, Michael and I found out that the leftovers worked great as a burrito! Dress it up however you like. I added shredded cheese and chips (for an awesome crunch), and Michael added cheese, chips, some salsa and jalapenos. However you doll it up, this Crock Pot Taco Cheese Dip is sure to be a hit as a burrito too! Yuuummmy! Stir in taco seasoning (without water) and place ground beef mixture in crock pot. Cut cheese into small cubes and place in crock pot. Add refried beans to the crock pot and stir. Cover and cook on low, stirring frequently. 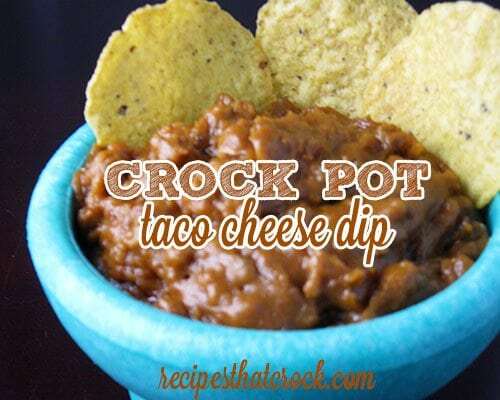 Once the cheese is melted and the mixture is heated through, put your crock pot on warm and serve with tortilla chips. Any 5-6 qt slow cooker will work just fine. Although, given the cheese in this recipe, our self-stirring crock pot is also a solid choice! We call this Armadillo Dip. Yumm! If you use a 32 oz. package isn’t that a lot of cheese for only 1 pound of ground beef? The regular size one…I believe it is 32 oz. Enjoy!